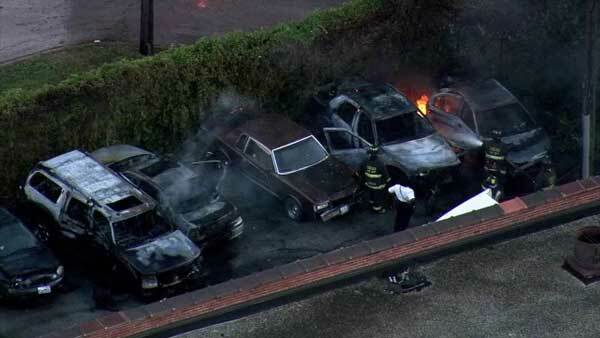 Several cars caught fire outside a body shop in the city's South Chicago neighborhood. CHICAGO (WLS) -- Investigators are looking into whether someone set five cars on fire in the city's South Chicago neighborhood. Officers received a report of smoke and flames coming from cars in the lot of a Maaco repair shop located near South Chicago and Clyde avenues around 5:55 a.m. Monday. The manager at Maaco said they rent the lot to OTF Towing. The burned cars belong to the towing company. Police said they suspect arson. The investigation is ongoing. Officers also responded to an accident involving a black SUV and Streets and Sanitation vehicle near South Chicago and Clyde. No serious injuries were reported.